March of Masterpieces has started! Devil May Cry 5 brings back the classic DMC lightning fast hack-and-slash action and cutting edge visuals. Tom Clancy's The Division 2 is the most awaited co-op looter shooter of the year, taking the Division / Destiny formula to the next level. 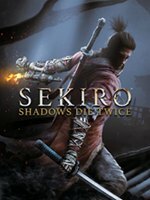 Sekiro: Shadows Die Twice is another unforgettable game from the creators of Dark Souls, this time even faster-paced than Bloodborne. Left Alive takes the mantle of Metal Gear Solid, combining stealth survival with mechs in an open world Cold War setting. Tropico 6 makes you the leader of not only one island, but a whole archipelago! It's a paradise, but it will take a wise ruler to keep it this way. Own the best games of March. SAVE with Kinguin! The king of cinematic beat-em ups is back! Join Dante, Nero and V in their quest to slash through bloodsucking demons in Red Grave City. A plague has reshaped the order of the world. Explore and loot the devastated and deserted city of Washington - alone or with a team of three friends. Move. Cut. React. Your skill will be tested in the new ninja game from the makers of Dark Souls. Instead of leveling your character, level up yourself.